Stick a sock in it, will ya?! That’s right, stop being so hard on yourself and start treating yourself like you treat everybody else. You know how you practically hang out the car window cheering and ringing your imaginary cowbell for nearly every runner you see on the road–whether they’re blazing past or shuffling along? 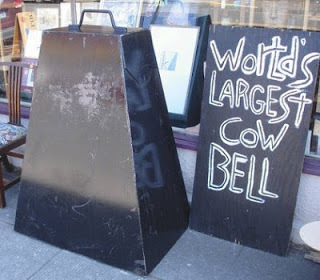 Instead of lamenting that you’re only running “so far” or “so fast,” ring your own damn cowbell. That’s right, ring it loud and ring it proud because you are out there, too, my friend. Instead of criticizing yourself for not running as fast as you’d like, celebrate that you have the guts to set your goals high and the tenacity to chase after those big dreams. Focus on being in the moment and running where you are, and not where you want to be. Keep working at it consistently, and have faith that you will get there. Because you WILL get there. Instead of beating yourself up because you missed a workout, remember that while running is your passion, your joy, your everything, taking care of a sick child or elderly parent will always trump your tempo run. That’s what makes you human. And because you missed your run yesterday, there’s no doubt you will make it happen today, even if you have to get up at o-dark-thirty. That’s what makes you a runner. And one other thing, you know that extra little bit of…ahem…fluff, which loves you so much that it doesn’t want to let go? EMBRACE IT! It doesn’t define your athleticism or your will power or anything. It’s just one tiny part of your strong, beautiful body–the body that’s going to carry you through mile after mile and help you reach your big goals. When that fluff knows you’ve had enough, it will suddenly disappear and you probably won’t even notice it because you’ll be too busy focusing on more important things. So listen up, Self: no matter what kind of day you’re having out there on the road, track or trail, no matter how tired or sore you are, no matter what your race pace or place, remember that you are a runner, and being a runner is a gift–an outrageous gift that deserves nothing but celebration. Love it! Mine too. Thanks for swinging by to share your two cents. I’ve been enjoying peeking at your blog. Lots of great stuff going on over there. Happy Weekend to you! I just stuck a sock in it, but I still need you to encourage me as much as possible! My cowbell is always ringing for you, Jessica! If I’m running and having a hard time, I remind myself of the many times that things have changed for the better before. It’s easy to forget that! So true, Tina! Thanks for stopping by to share your thoughts. I enjoyed peeking at your blog and can see you are up to lots of fun stuff!